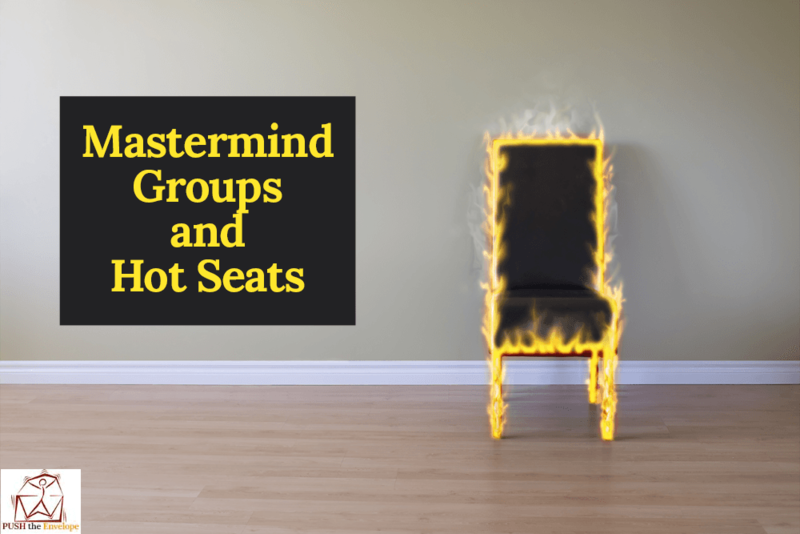 If you're currently researching mastermind groups and thinking about joining one, you may have heard the term "Hot Seat" tossed around. To be clear, this doesn't refer to the heating element in luxury cars, nor is it having a bright light shining on you while you're grilled for information. The Hot Seat (can also be called various things depending on the group you join) is the position in a mastermind group when you get to ask for exactly what you need to move your business or yourself forward. You could be asking a specific question, asking for advice about a problem you're facing, getting help with a decision you're facing, or wanting feedback and ideas on changes you want to make. The Hot Seat is where mastermind group magic happens. The thought of being in the limelight - the Hot Seat - where all eyes are on you can be scary. No matter how large or small your mastermind group, being the center of attention can be daunting, especially when you're baring the soul of your business. But if you remember that the purpose of a mastermind group is to provide feedback in a supportive and constructive way so all members can grow and prosper, Hot Seat becomes less onerous. Every mastermind Facilitator uses their own term, and many allow the group members to decide what to call their Hot Seat position. What you call it doesn't matter as long as it provides the benefits expected from a Hot Seat. You're facing a challenge in your business; your mastermind group is there to help. Whether you're looking to increase profits, decrease stress, or re-brand yourself, you bring it to your group through your Hot Seat. Most often, your Facilitator will ask you to submit a Prep Form before the meeting. That tool allows you to get clear in your mind exactly what's going on for you and where you need help from the group. During your Hot Seat, all the attention is on you (in a good way). Other members brainstorm possible solutions, provide feedback about your new design or service, or share experiences they've had in their own business to support you in yours. By the end of your Hot Seat, you'll have a host of new ideas you may never have come up with working alone. How Often Should You Be in the Hot Seat? There are many factors in determining how often you'll be in the Hot Seat in any mastermind group. It's usually defined by the Facilitator and the structure created for the group. What you need to think about when you're joining a mastermind group is this: The Hot Seat is the power point of the group and where the real value to you lies. You want to have a Hot Seat on a regular basis. Groups that allow members to be in a Hot Seat monthly mean you benefit from the wisdom of group members a lot. If a mastermind group allows you only one Hot Seat a year, you might reconsider joining it. Talk to the Facilitator if you have any questions. What if I'm Not in the Hot Seat This Meeting? The great thing about mastermind groups is they're a collaborative experience. While you may not get your exact question answered during a meeting, you'll still learn from other members. As business owners, members are likely to have similar challenges even when in different industries. By listening and helping others, you might just find you're getting answers and ideas for your own challenges. When you're ready to take your business to the next level, join a mastermind group and enjoy all of the benefits the Hot Seat and your group have to offer.